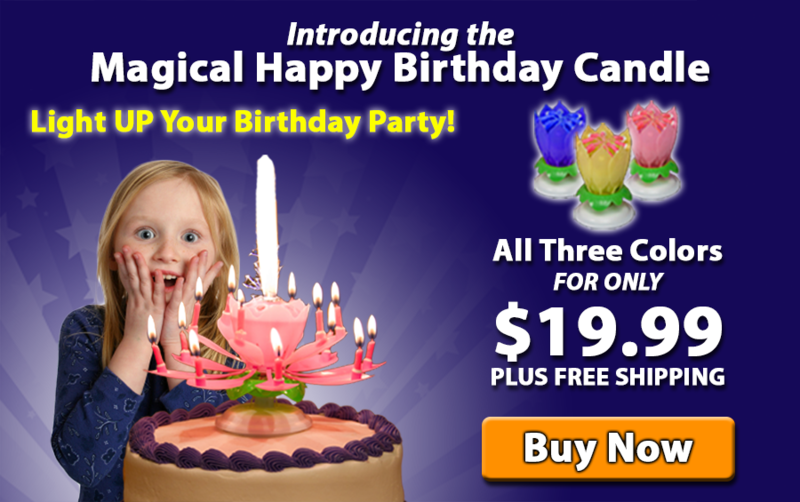 One order gets 3 Musical Flower Birthday Candles (one of each color). This new candle will change the way we serve our birthday cakes in the future. With the birthday candle, you can hear the melody “Happy Birthday to You” or the music can be disabled thus making it appropriate for New Years, Valentines Day, Easter, Mothers Day, Graduation, Fathers Day, Fourth of July, Labor Day, and Christmas. In any case, the unique qualities of this candle will thrill kids and adults alike. This website is designed to meet the needs of our customers who are currently not served by a local bakery which stocks the candle. Bakeries and distributors are encouraged to click on "contact us". In this website you can order up to two orders (six candles) and 3 USB Drives for one flat shipping and handling price of $6.95. Be sure to read the operating instructions and safety precautions on the box before use. Watch the Happy Birthday Candle in Action! © 2019 Clear Value Products. All Rights Reserved.